I love eating salmon; the other day my boyfriend & I were talking about cooking fish and we discovered that neither of us knows how to deal with any type of fish although we love eating it. I found this recipe on the Food Network, by Paula Deen, and it seems fairly easy to follow (especially since it's for grilling). Prepare grill by lightly oiling grill grate over medium-high heat. In a small saucepan, melt butter add lime juice. Salt and pepper the salmon fillets modestly on both sides. Place fillets onto grill, brush half of lime butter over salmon. 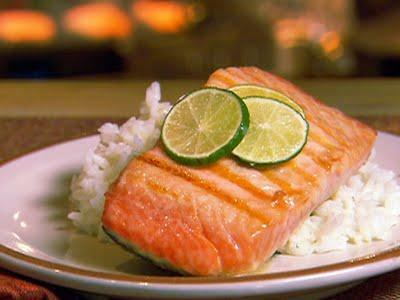 Grill salmon for 2 to 3 minutes per side for medium-rare. Drizzle remaining lime butter over salmon before serving. Serve with pasta or rice.